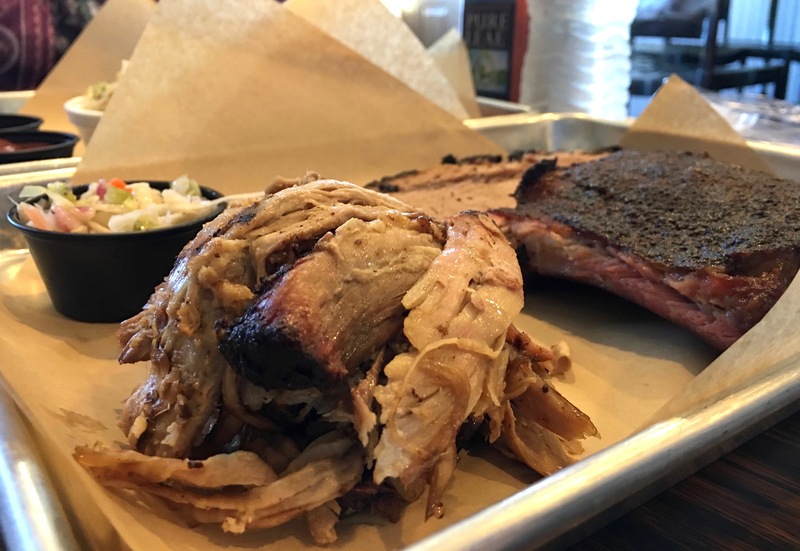 Just Q’in BBQ (Newtown and Walnut Hills) – Go There. Try That. Just Q’in’s motto is “Faith. Love. BBQ.” In addition to loving their barbecue, I have faith in this restaurant. In fact, I’m actually pretty picky about barbecue. I want the best of backyard cookouts, but the quality of finer dining. Considering I’ve been to Just Q’in four times, I’d say it’s earned my stamp of approval. 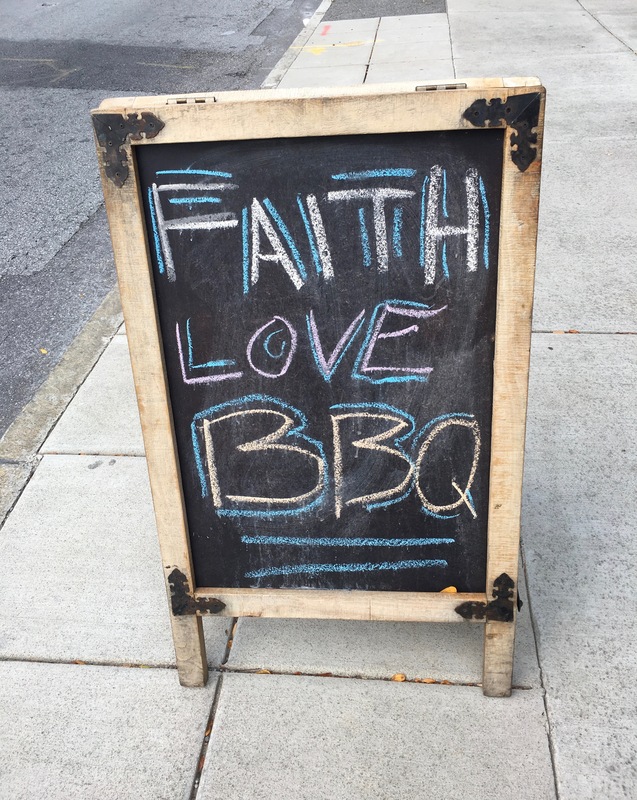 Faith based barbecue with a food mission. 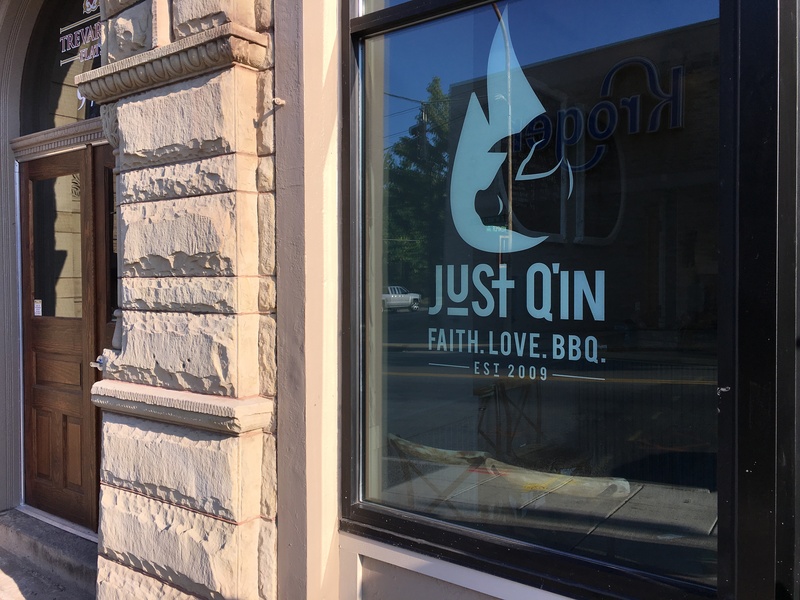 Just Q’in has two locations; the original spot is in Newtown and the newest in Walnut Hills. The Newtown location is marked by the big ol’ smoker outside. With just a couple tables inside, space is limited. However, there’s lots of takeout happening here, and, when the weather is nice, there are several outside tables for alfresco dining. 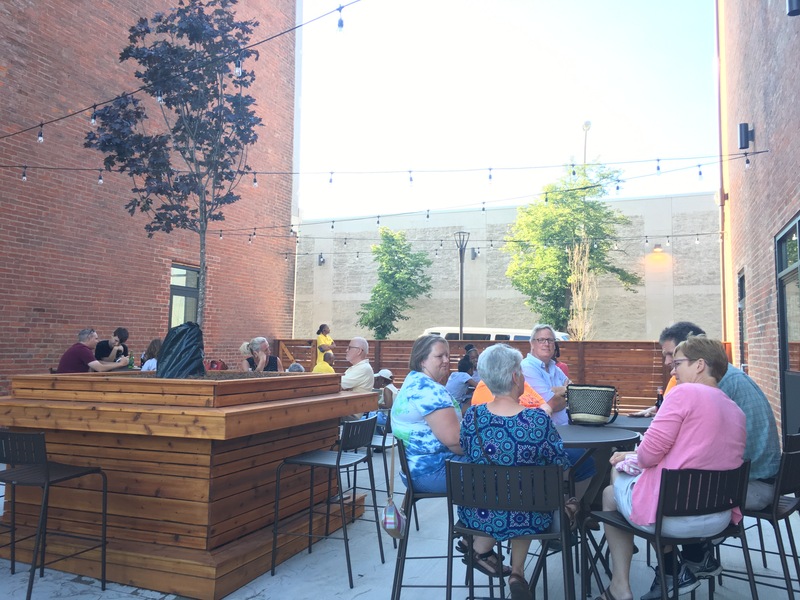 Sitting on the corner of Kemper and McMillan, the Walnut Hills location is bigger, relatively speaking, and has a super cute courtyard with outdoor seating. Smooth blues music sets the mood and the brick and wood fixtures make you feel at home! 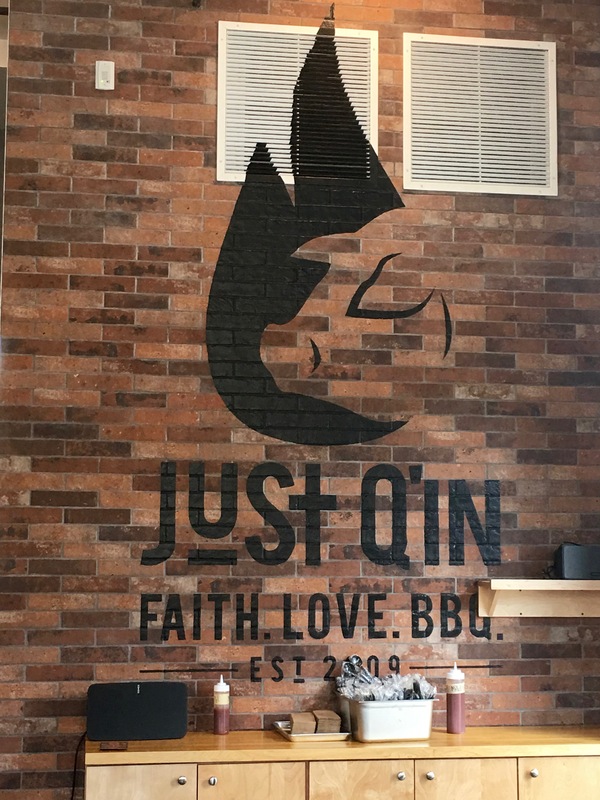 Most of the staff here is hired from the local community and Cincinnati Works; this goes back to the faith-based philosophy behind Just Q’in. Plus, this neighborhood is on the cusp of revitalization and Just Q’in is a positive step in that direction. Although the Newtown location is actually closer to me, I like the brightness and the vibe of Walnut Hills. After eating there the first time, I sent an email inquiring about their beautiful rustic wood tables. I was pleased to learn they are made by Wessling Tree Service in Newtown- again, keeping it local. Whichever location you pick, the food will be good! 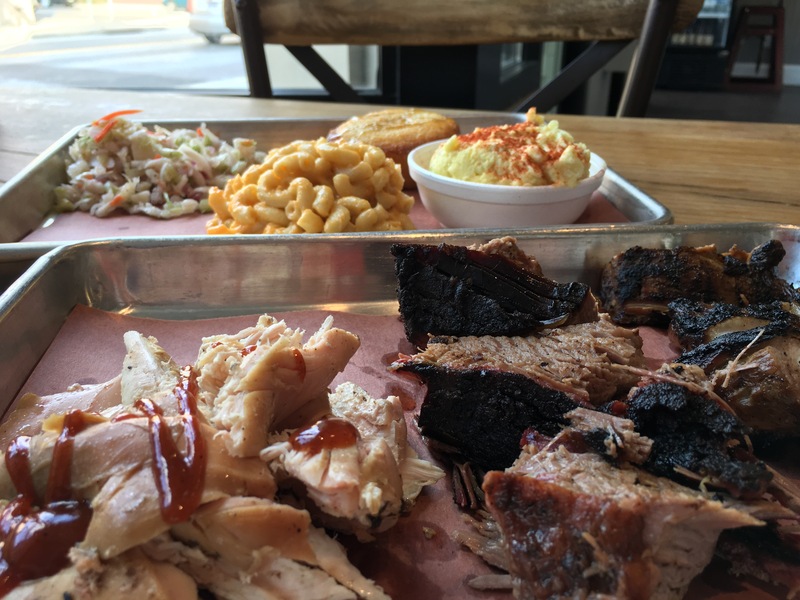 When we go, we always order The Farm plate which comes with three meats (customer choice) and two sides. Honestly, I have not eaten one single thing at Just Q’in that I didn’t like, so I’m going to simplify this post by highlighting my favorites. Chicken: This is not my typical go-to order, but this chicken is a must. It’s super tender and the flavor perfectly smoky. I add a little extra barbecue sauce to mine, but my husband eats his straight up. Speaking of barbecue sauce, Just Q’in offers mild and hot. Both are tasty, but the hot has a little extra something something that I dig. Brisket: Oh, snap! This brisket is pull apart, melt-in-your-mouth goodness. Hands down, this is the best brisket I’ve had in a long time. Oh, and the dark bits, which might look burnt to the untrained barbecue “fan,” taste like meat candy. Let me repeat that. Meat candy! Cole Slaw: Love it! This one is vinegar-based with chopped cabbage, onions, and celery. The addition of onions is nice. Fresh, crisp, and slightly crunchy, this slaw is a winner. Plus, I’m always happy to find slaws not made with mayo, and this one is exceptionally good. Mac and Cheese: Think rich and creamy, the way any good mac and cheese should be. The pasta is perfectly cooked and coated in velvety cheese. I love that it’s full-flavored without being too heavy as some mac and cheese dishes can be. Cornbread: If I can be honest, I’m not sacrificing a side for cornbread, but this cornbread is worth the add-on. I might not be a cornbread or biscuit enthusiast, but I dig Just Q’in’s jalapeno cornbread. It’s not dry (sorry, but many cornbreads are) and the jalapeno provides the gentlest of kicks . . . and did I mention it’s drizzled with honey on top?! Save it for dessert! While I didn’t feature it, the pulled pork is great as well. 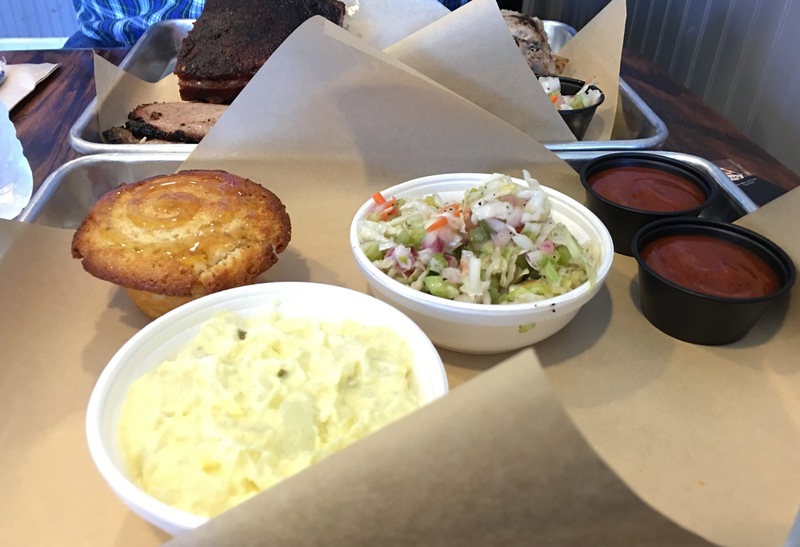 Love the cole slaw and jalapeno cornbread. Mild and Hot sauce ready to go. 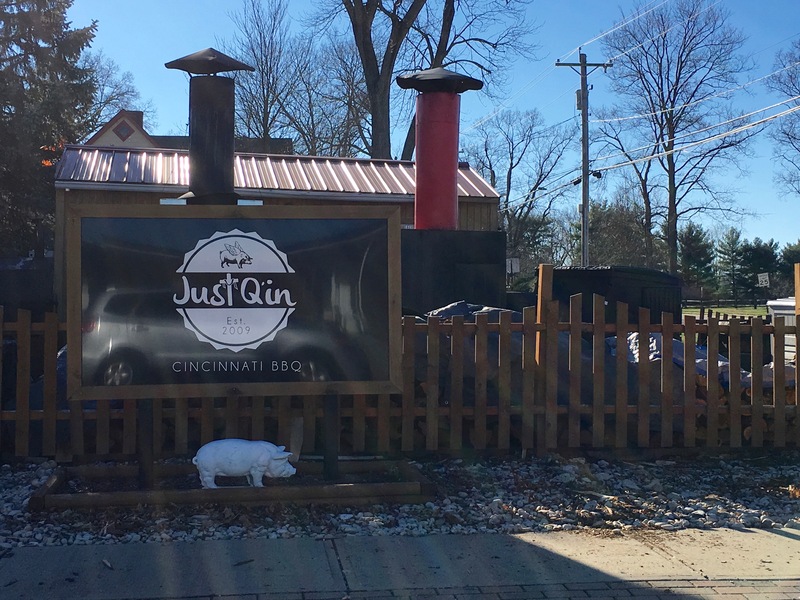 Just Q’in began as a competition barbecue team in South Carolina before entering the killer food truck scene in Cincinnati! I, for one, am happy they set up shop(s) here in the Queen City. Now I just need to try those smoked wings . . .
P.S- be sure to check the hours before heading over. The Walnut Hills restaurant closes at 5pm Sundays and 8pm weekdays. GO THERE (Just Q’in)! TRY THAT (Brisket, chicken, Cole slaw, Mac and Cheese)! My mouth is watering! Great description and photos! How much for The Farm? Hello! Great question. The Farm is $15.50. We share it (two people). Then the extra cornbread is like $1.50. Enjoy! !